Display From Ur of the Chaldees The British Museum, London. We have lots to thank the Sumerian civilization for--the invention of the wheel, sail boats, amazing irrigation systems, the concept of the city* and lastly, lipstick. From 2500 to 1000 BC. the ancient Mesopotami (modern-day Iraq and Kuwait), used pulverized semiprecious stones and jewels to make pastes for beautifying the lips and skin. Dried insects such as the cochineal (used to make carmine), berries, and clay were also used to create pigments and were quite readily available to all as they did not require money nor chemicals to produce. It is said the Sumerian Queen Shub-ad preferred a mixture of crushed red rock and white lead. Not exactly todays moisture-rich 24-hour-wear option, but in ancient times that DIY flow was all the rage. Some scientists claim that the lead content in ancient cosmetics, specifically eyeliner, could have been initially medicinal and antimicrobial, but as we know today, prolonged use could cause serious and irreversible damage, birth defects and even death. Corinthian pyxis with a red make-up powder, 5th BC. Fast forward to 9 AD during the "Islamic Golden Age", Arab scientist, Abulcasis invented the first solid lipstick. Accidentally, he stumbled upon the formula while mixing stock for a sort of solid perfume that could later be pressed into a mold. 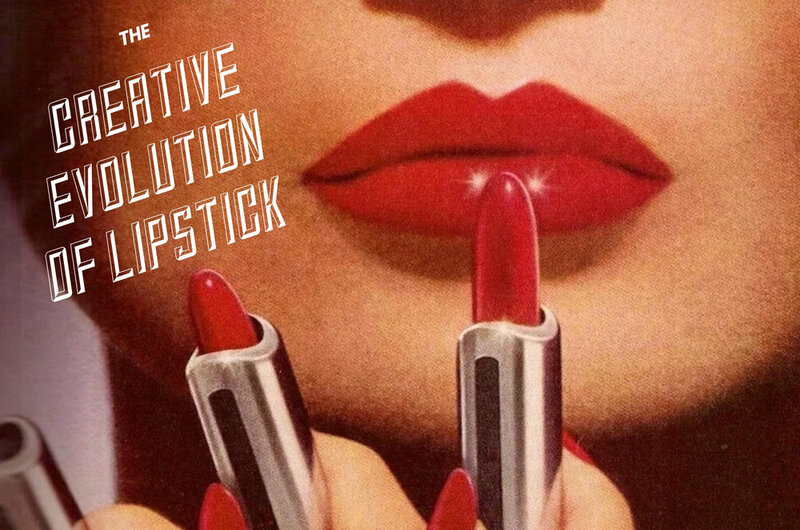 He had the genius idea to mix in pigment and voilà!-- the first lipstick was born. Meanwhile in Egypt (2000 BC to 100 AD. ) the peoples of the area began using a seaweed mixture to tint their lips reddish-purple. That color was squeezed from Iodine and eventually became known as “the kiss of death” (Dixon, Lisa Potter "The Natural Makeup Manual" London, Ryland Peters and Small, 2017) Crushed ant eggs and carmine was an old favorite recipe used by Cleopatra herself! Fish scales were often used for added shine. 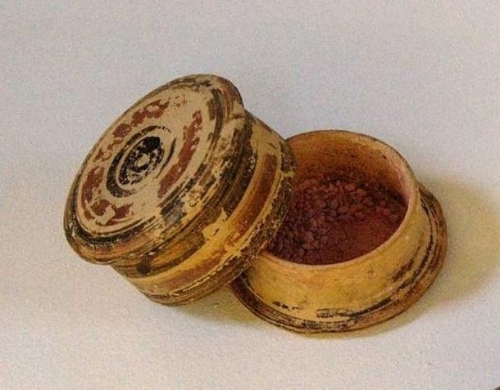 During a woman's life, lip paint was applied using wet sticks of wood, and, in death, each well-to-do woman took at least two pots of lip paint to her tomb. For the women of Ancient Greece --which was quite sexist, society did not grant women any power or privileges-- wearing lipstick was a big No-No ...unless of course, you were a prostitute. Interestingly, prostitutes were allowed a few more rights, including the ability to own businesses and earn money with with they could buy more freedoms. (*Huge eye roll* Guess they should change that quote to "well behaved women rarely advance history...") Red dye, sheep sweat and crocodile excrement was used to create lipstick and funnily, led to the first known law related to lipstick which stated that any woman of ill-repute who appeared without their designated lip paint, would be punished by the law for impersonation of a "lady". In Medieval Europe (400s-1400s A.D.), the practice of painting oneself in any perceivable fashion went in and out of vogue. Various religious groups tried to claim that makeup of any sort was "challenging God and his workmanship." (Steele, Valerie (ed.). "Encyclopedia of Clothing and Fashion." New York: Charles Scribners & Sons, 2004.) Meanwhile Italian high society ladies wore a bright pink lip and lower classes wore earthier reddish tones to make sure everyone (*ahem*, men and some other bougie haters) knew of their inferior social standing during a period of time in the 1200's. Much like the early Mesopotomians, the use of insects and berries were also popular in Latin American and Russia during the 11th-13 centuries. Prior to the Spanish Inquisition, European women applied cinnabar (vermillion) as lipstick-- an extremely toxic beauty ritual as it is comprised of mercuric sulfide. Queen Victoria, Queen of the United Kingdom, Great Britain and Ireland seriously brought the vibe down during the 1800's and lipstick fell out of vogue. It didn't take long for the people to bring it back in 1860, The world rejoiced and the cosmetics industry began to boom once more. By 1950, the world was at war and for many women "Beauty was their duty." 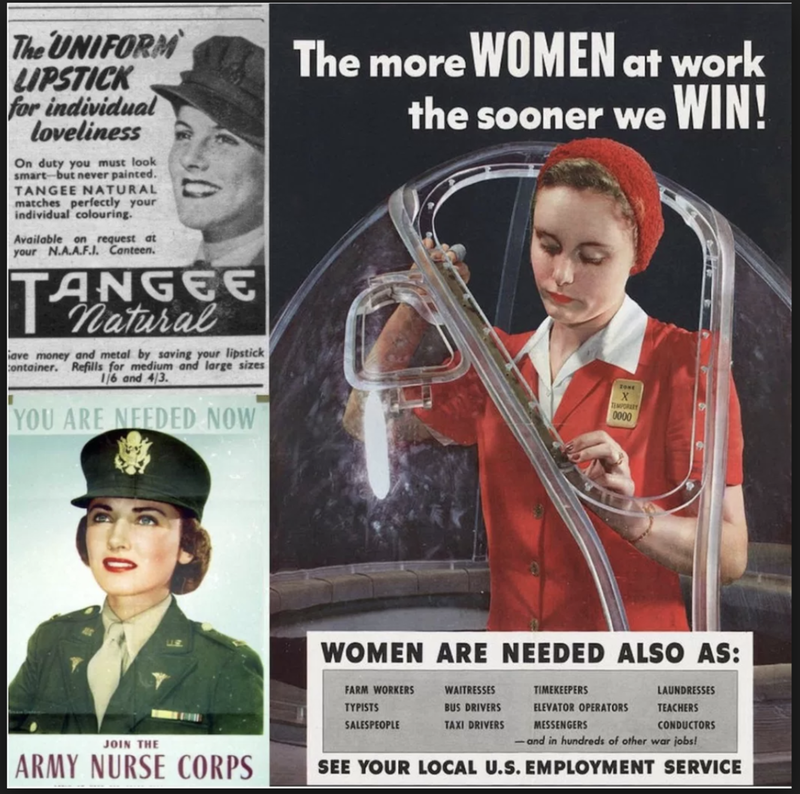 This was not entirely by accident either, Adolph Hitler hated red lipstick (and painted nails), and so American women wore it as a symbol of resistance.